Yesterday was so beautiful and sunny and warm, but today was going to be overcast and a bit chillier. That is actually the normal weather in Norway, cold and rainy or overcast. So I guess the really nice weather we had yesterday was just lucky! My first concern after hitting the road was to try and find some coffee. Since this is Norway, and everything is crazy expensive, going to a cafe to get a nice latte or cappuccino was out of the question, since that would cost at least $10. We opted for the cheaper gas station coffee machine option, which was "only" 25 kroner, or almost $5. I was still so sleepy when I got the coffee, I totally didn't notice the coffee machine for the public customers right in the front of the store, and I somehow wandered into the employee break room where I found a smaller coffee machine (but it made bigger sized coffees) and made two nice big coffees. Then when I went to the register, the cashier was so confused when I tried paying for the coffee. He asked me, "Where did you get this?" And I told him, and pointed to the break room. I now felt a little embarassed, after he pointed to the big gigantic coffee machine for the public use. Oops! Oh well! There were many spectacular waterfalls along the way to Bergen. 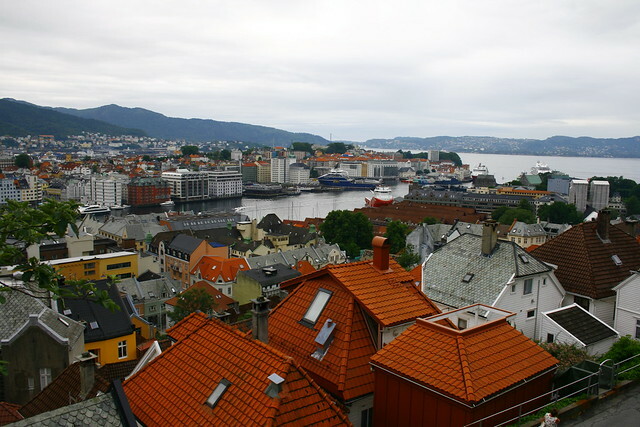 The city of Bergen from above. 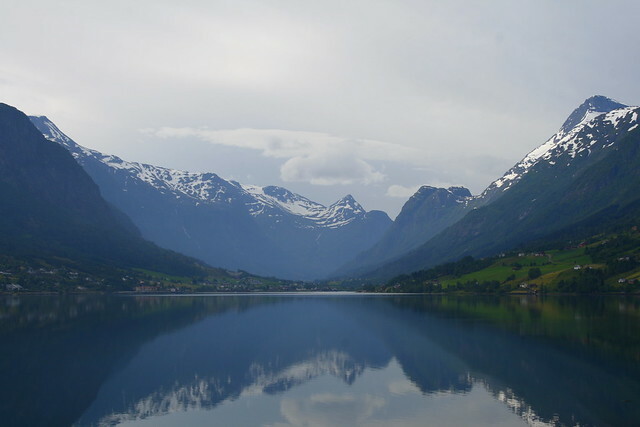 It didn't take us long to get to Bergen once we were over the Sognefjorden. The weather started getting gloomier and rainy, but we just hoped for the best. Along the way, I was feeling like more coffee, so we stopped at another gas station place. We found a little shop that sold waffles and coffee for 10 kroner each, so we got some to try. They had nice picnic tables outside where you could eat, perched above the fjord we just crossed over. The waffles were really good, like crepes. But it didn't take us very long to eat them, and drink the coffee too, so we were soon on our way again. I texted Cova to let her know we were on our way! 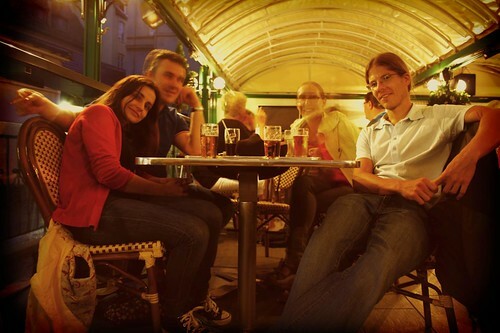 We visited my friend Cova and her fiance Vidar in Bergen. Cova lives with her fiance, Vidar, in the center of Bergen. It was really easy finding her condo, so we had no trouble, even with our crappy map. It was so nice to see Cova again! She had a spare bedroom where she set us up with fresh sheets and towels, and she even made us some fresh coffee when we got there! Then we went out to walk around the city for a while. We saw the downtown shopping area and main square, and then we walked to the ports and docks. In Bergen there is a section of very old houses (almost 1000 years old) and warehouses that are still standing, called Bryggen. Most of them are really crooked and there isn't a 90 degree corner anywhere. It was really funny to walk through. Now there are a bunch of shops and stuff built inside the old buildings. We also saw the old fort building nearby Bryggen. Next, we went up the big hill behind the city, and climbed up the steep streets through a really nice neighborhood. When we got near the top, you could see almost the whole city of Bergen below. It was neat, but also very tiring (well, not really but we were already kind of tired). So it was time for a beer! Romy found a VW nut on the Norwegian equivalent of craigslist. 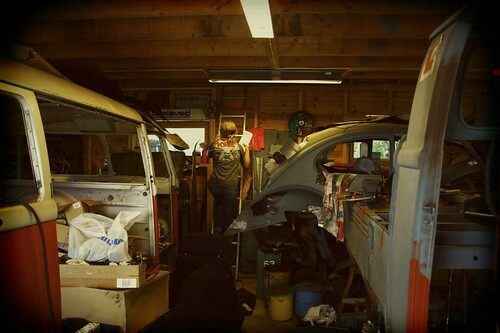 He explored his mini junkyard of VWs and bought a few parts. That afternoon we went bar/restaurant hopping, have a beer here, and beer there, and then dinner at a new restaurant that had four menus to chose from. Vidar finally got off work and joined us about an hour after our first beer. They told us about their jobs. They both work for the oil industry. Cova designs pumps and Vidar designs two phase flow meters and also takes care of customer servicing for the flow meters. They are going to get married next year in Spain! How exciting! They had a really nice condo, which was very nice to come back to after a late night out. We've been living in a relatively crappy shared apartment flat with a bunch of old and half the time broken and unmaintained things. It was nice to be in a normal abode for the first time in almost two months where everything was functional! On the way back to Trondheim, we drove through the Lærdal Tunnel. We couldn't stay long in Bergen the next morning. After a nice big breakfast of pancakes and some fruit, we packed up and hit the road. The weather was improving again as we drove back. This time, we took the inland route, which is the main way most people drive when they are going north-south across the country. One of the highlights was stopping in Voss. The city itself was okay, but we were there to see a guy who had a whole bunch of old VWs. Romy found this guy on finn.no, which is the Norwegian version of craigslist. 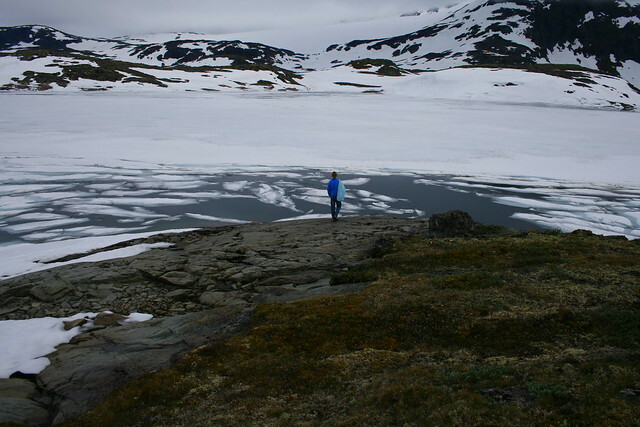 He lived just up the mountain from Voss, a few kilometers away. 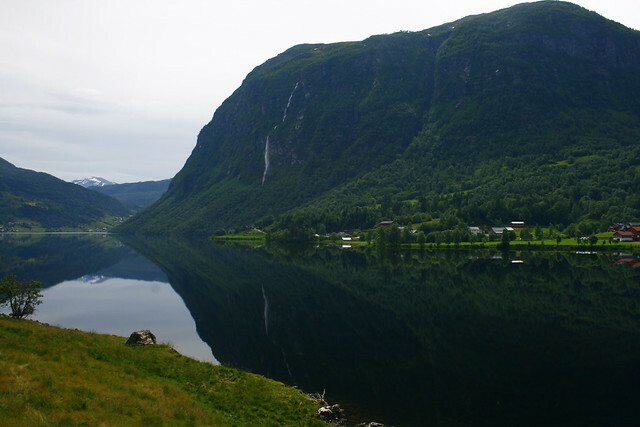 And by the way, Voss is the city where the super expensive bottled water comes from, called Voss. I guess they take the water from the lake or something? Not sure why anybody would pay for Voss water (unless its the cheapest option on the menu like in the John Hancock Tower in Chicago). Well, anyways, when we got there, we knew we were in the right place. Suddenly, out of the forested mountainside, a whole bunch of VWs popped up. Beetles, bay windows, old splits, and even some dokas and syncros were all there. It was cool! Needless to say, we spent over an hour there as Romy talked to Christer about all of his projects and cars. Romy even bought a few parts from him, some lights and parts for the beetle dashboard for pretty cheap. And now we know somebody in Norway who can get us a diesel doka syncro when we are ready! Romy getting ready to check the waters for a dip! It was almost 5pm and we were barely out of Bergen still in Voss at Christer's VW place. I gave Romy the signal that it was probably a good time to leave, and in the typical Romy fashion, we were ready to go about 1/2 hour after that. We tried to pick the most direct route back as possible, which involved choosing between a ferry boat, or a really really long tunnel, 25km long. I wanted to do the tunnel because it was so long and that in itself made it more interesting to me. I am really glad we picked the tunnel because it ended up being super cool! As we drove through, we had to stay at the speed limit because there are speed cameras inside of the tunnel. This is a form of Norwegian torture. They can be anywhere and there can be multiple, with only one warning sign to let you know. The speed limit is (I think) 80 kmph, which is a crawling 50 mph!!!! So slow! So you can image, we had some time to enjoy the scenery inside the tunnel which consisted of dirty rock walls, some weak lighting, and large fans every once in a while. But every few kilometers (this tunnel was 25 km long) there were these super brightly lit rest areas to stop and pull over in. They were partly to wake you up and partly just cool, like an art form. I was afraid to get out at first because the air inside the tunnel was probably nasty. Later I read that the tunnel has its own air filtration system. We decided to stop and get out and take a few pictures at the last rest area. The air didn't smell too bad. 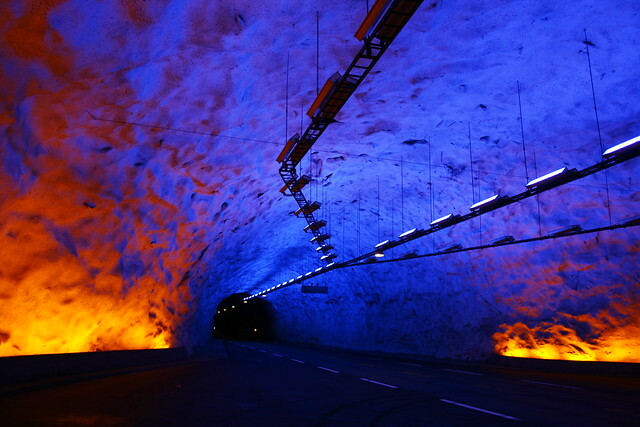 When we got home, I googled the tunnel and figured out that it is in fact, the longest road tunnel in the world and it's called the Lærdal Tunnel! And we drove it by chance! That was so cool! 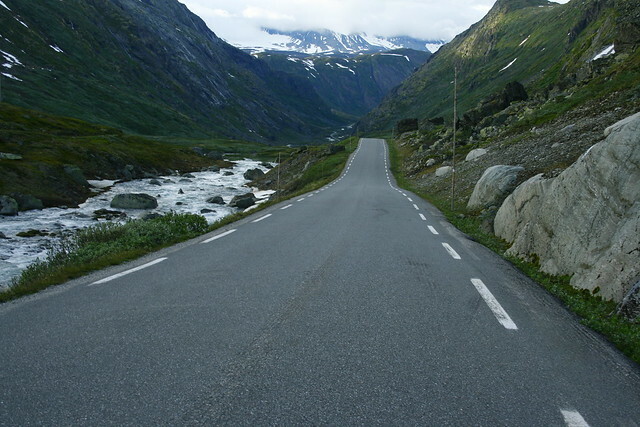 A typical road through the mountains of the interior part of the country. Because it was still a long long way back to Trondheim at the Norwegian speed limits, we didn't end up getting back to our place until 2am! When we finally did get back, we went to sleep for a few hours, and then had to get up before 8am to return the car back to SIXT. What a journey! I felt like we saw so much in just 3 days. It was so worth it and I wish we had more time to do road trips like that. I love road trips!